Welcome to the second installment of Bit by Bloody Bit, Corrupts Absolutely? edition. 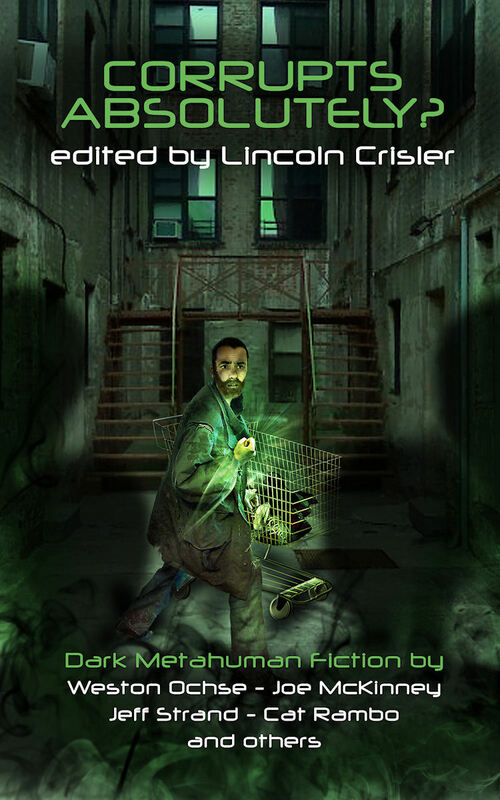 Corrupts is anthology featuring dark metahuman fiction, the perfect collection for horror fans with a taste for superhero prose or lovers of hero tales who enjoy a bit of corruption with a horror flavor. This medley of stories has a common theme–fiction about people with superpowers–but covers a range of scenarios which bring into question what real life human beings, people with vulnerabilities and flaws, would really do if they had superhuman strength or advanced mental capabilities. The first installment from this collection featured some downright nasty, sadistic, and purely evil individuals using their power to inflict pain and suffering on the innocent, but this next round of 5 stories goes in a slightly different direction. Now we explore the gray area of vigilante justice, or the misguided hero. Some of the superheroes (?) featured in these stories have all the best of intentions, but human weakness has a tendency to corrupt their cause, hence the question mark in the title of the anthology. Are these people really corrupt? Or are they doing what is best for mankind? Is an eye for an eye real justice? Is man (or woman) meant to play God? These are all questions provoked in this 2nd quarter of Corrupts Absolutely? Out of the five stories in this installment of Bit by Bloody Bit, Jason M. Tucker’s “Enlightened by Sin” is the closest to being a straight superhero vs. supervillain story. Victor Ives is a reporter for the Angel City Beat by day, moonlighting as a superhero, cleansing the city of scum, by night. While this scenario may remind you of Clark Kent or Peter Parker, Victor ain’t no Superman or Spider-Man. As readers will quickly realize reading this anthology, this is a fantasy world but considers a very real darkness in our human character. For such a brief story, Tucker is able to provide a lay of the land in Angel City without being cumbersome with his words for the set-up. There is complicated web of Aberrants, corrupt politics, and vigilante justice at play in this tale, but all the detail develops naturally without overwhelming the reader. Victor Ives has a mantra he likes to repeat before doling out justice; “I know the bad things you’ve done. I know the horrible things you are going to do. Your fear betrays you. I can smell the blackness on your soul and I see your inhumanity flash in my mind’s eye. You can’t hide your corruption. No one can. And that’s why you have to die.” Even though Victor starts out with his heart in the right place, there is a tricky side to power; you could “be a dark god or a shining hero.” And Victor can’t be too sure where he will fall. The next story was the main reason I picked up this collection. I am a fan of Lincoln Crisler and our tastes are aligned when it comes to horror fiction, so I knew I would be in good hands with him as editor, but the inclusion of a Jeff Strand title made this a no-brainer. As fans have come to expect from Strand, and the title suggests, his short “The Origin of Slashy” is thick with inky black humor. The subject matter is serious, but Strand is a master of horror-comedy, so even though the content is centered on brutal reality he elicits chuckles without being inappropriate or offensive. “Kaylie was raped.” That’s how his story begins. After this tragic incident, thinking she can’t live with the horror of the violation, she attempts suicide, but discovers instead that she has self-healing powers. This discovery gives her a renewed sense of purpose and an uncontrollable urge for vengeance. Like the protagonist in Tim Marquitz’ “Retribution,” Strand’s Kaylie offers a grim perspective on misguided vengeance considering circumstances in which there is no clear target for retribution. Good and evil may be black & white in the superhero world, but in Corrupts Absolutely? there are various shades of gray that exist in between. Following that, we meet poor young Punkinhead Abassi. He lives in a rough area, is tormented by the GDs that run the streets, and haunted by the death of his drug addicted sister Lateesa. Edward M. Erdelac’s “Conviction” opens as counselor Daniela Orozco tries delicately to get the emotionally fragile Abassi to open up about his problems. His drawings indicate a strong artistic talent but also a potentially dangerous mental disorder. Of course, it is the non-stop abuses of all those around him dragging him down to this depressed state. Miss Orozco encourages Abassi to draw what he wants to see in the world, the world he wants to live in. Like the titular Carrie in Stephen King’s classic novel, Abassi channels his talents to work to his advantage and I don’t think there is a reader who won’t be cheering him on. Compared to Strand’s story which precedes it, Erdelac’s tale has a decidedly serious and heartbreaking tone, but that is the beauty of this collection. The imperfections in man that guide their choices upon the acquisition of superhuman power are complicated and vast. While some men are driven by greed, others are driven by pain and loss. In “Threshold” by Kris Ashton, we continue to explore the cruel fate that comes into play, even for a superhero driven to use his power for good. Told in the first-person, our narrator explains his special skill. He can read the deepest and most vile acts of man and woman. Unfortunately his talent comes with the crippling migraine that can only be cured when he ends their life. He never knows when the pain will strike or who will be the target, or even what causes the unbearable episodes. He only knows what they did to cause his agony and what he must do to stop the pain. His next mission hits too close to home and our narrator must make a decision. “Which of us has to die?” Even if you’re driven toward good, in the world of Corrupts the life of a superhero can never be that simple, or that black and white. Ashton builds the suspense in his story impeccably and elicits sympathy for his narrator effortlessly. Those two elements facilitate an ending that is both shocking and heartbreaking. The last story in this section of the book, “Oily” by A.D. Spencer, highlights the dangers of human error in vigilante justice. Jim and his daughter Cin are a team. Jim crafts a special marble, oily, each time he gives Cin an assignment. She must then figure out what the mission is by perusing the papers for suspects. Once Cin has her target she becomes Cat’s Eye, manipulating the gifted oily with unlimited ease, doling out justice and freeing the streets of scumbags one marble at a time. Cin suspects her latest mark of murder, but is this a clear cut case of “eye for an eye?” Spencer’s story stays on track with this group of stories illustrating how the good guy can inadvertently do bad. Cin finds out that it’ll take more than a hunch and an oily to do the right thing. Even if this a test to evaluate her ability to make a fair judgment, does that mean she will always be equipped to make the right decision? All the stories in this section of Corrupts Absolutely? were consistently entertaining and perhaps contained the most sympathetic characters in the collection. Instead of the corruption, greed, power-hungry metahumans of the first section, these people want (or are driven by outside forces) to use their powers for a positive end. But unfortunately, good intentions are never enough. Each story had its own unique charm and were all memorable. You can pick up Corrupts Absolutely? at Damnation Books or Amazon. Stop back next week for part 3 of Bit by Bloody Bit! This entry was posted in Anthologies, Authors, Reviews and tagged A.D. Spencer, Bit by Bloody Bit, Corrupts Absolutely?, Edward M. Erdelac, Jason M. Tucker, Jeff Strand, Kris Ashton, Lincoln Crisler by Meli Yoroshiku. Bookmark the permalink.